As millennials age and become responsible for more purchasing power brands will be forced to understand how the much maligned age group prefers to communicate and interact with them. 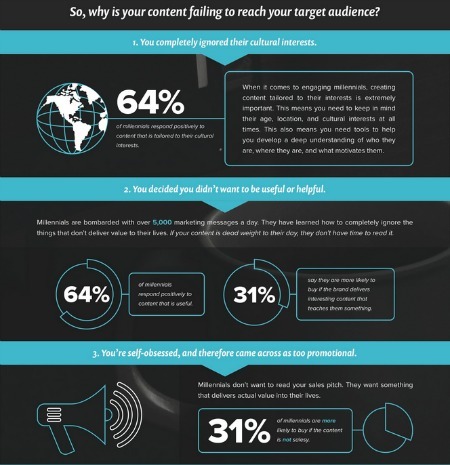 NewsCred, a content marketing platform, has announced the results of a new study on millennials titled “The Millennial Mind: How Content Drives Brand Loyalty,” which details the importance of quality online content for brands looking to drive deeper engagement from millennials. The study, conducted in October 2014 surveying 501 US millennials, revealed that nearly two out of three (62 percent) of millennials feel that online content drives their loyalty to a brand. However, millennials also stated that the same content can turn them off from brands for a variety of reasons including not helping them navigate their everyday problems, being too long as well as being sales-driven and not tailoring the message to individual cultural interests. Interestingly, social endorsements, where consumers share brand specific information on social networks, were found to have a rather small effect on millennials. In fact, just 26 percent of respondents said they prefer to use brands that their friends leverage. “Millennials today value quality over quantity when it comes to content marketing. Our survey data shows that the most important driver of brand loyalty for millennials is a great product at 77%, followed closely by brand recognition and trust at 69%. To me, this is an awesome sign for brands,” said Shafqat Islam, CEO and co-founder of NewsCred.